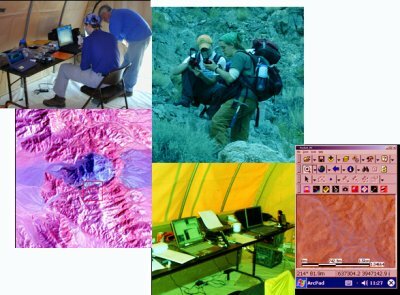 Active research at MIT in the field of digital geology is currently centered on the development of digital tools for field geology. Current projects consist of developing customized software for geologic mapping that runs on top of ESRIs ArcPad GIS software for iPAQ handheld computers, creating communications protocols to allow wireless interfaces between handheld computers, digital cameras, laptop computers, and other peripherals, and prototyping a digital geologists compass capable of the capture and storage of structural measurements in conjunction with handheld computers. Each of these projects has been underway since the fall of 2001. For the most part, the work has been completed on a piecemeal basis by graduate students who donated their time towards the projects. This summer, however, a National Science Foundation grant to explore the uses of digital technology in field geology, and the MIT Undergraduate Research Opportunities Program (UROP), have allowed the hiring of three full-time undergraduate research assistants. We expect significant progress to be made on each of these projects through the summer of 2002, as the undergraduates expand on the work already in progress. Browse through the list of personnel involved in the project this summer, or read through the project descriptions to see what it is that we are working on. Well try to post weekly progress updates throughout the summer to show how the projects are evolving. If you have any questions or comments, or would like more detailed information on our work, please e-mail us at dtfg@mit.edu, or contact us individually using the contact information below.